Some posts may contain affiliate links. For more information please see the disclosure page. 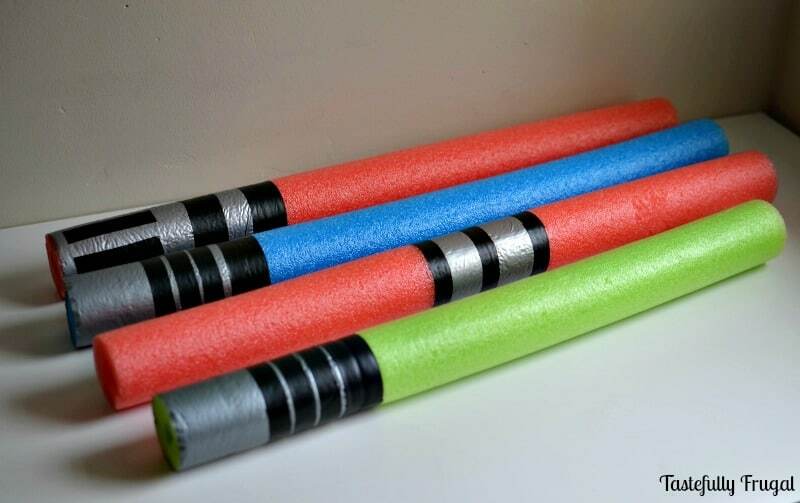 These pool noodle light sabers are a must have for any Star Wars party. When I was planning my son’s Star Wars Party the first thing I knew I had to have were light sabers. You see, my three year old loves Darth Vader. We watch Star Wars at least once a week and he has just about every Darth Vader toy known to man. For Halloween he was Darth Vader and for Christmas when he opened his light saber and other Star Wars toys he immediately ran up stairs and put on his costume to play. So it was a no brainer that light sabers would be a party favor at his birthday. 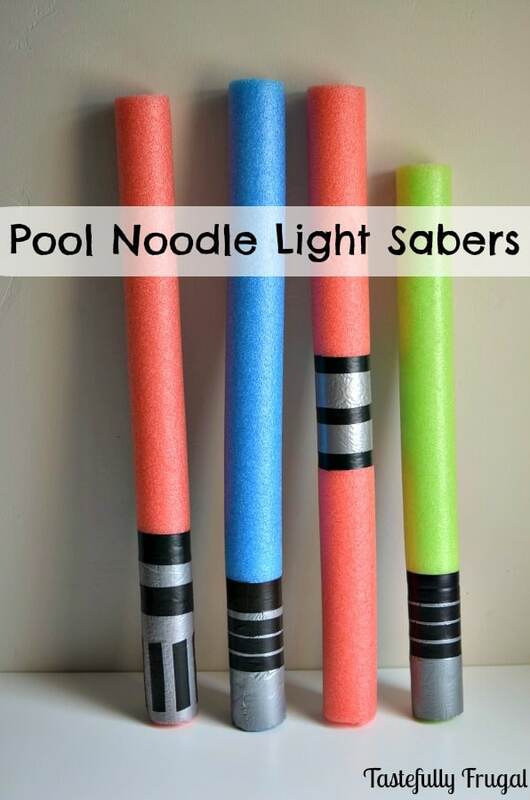 I’d seen the idea for pool noodle light sabers on Pinterest and I knew they would be perfect for our party. Not only are they budget friendly but they are really easy to make too. All Rohrl’s friends got to take home a light saber and Death Star Oreo Truffle and we even had a few left over. Light sabers that is; the truffles were gone in a heart beat! I’m actually surprised at how well these things hold up. We’ve had battles every day for about 2 weeks and every one has kept it’s shape and hasn’t broken. There are several ways to make these but I wanted them to be somewhat true to the real-life sabers. I’m sharing three different techniques on how to make them but feel free to make them any way you want. 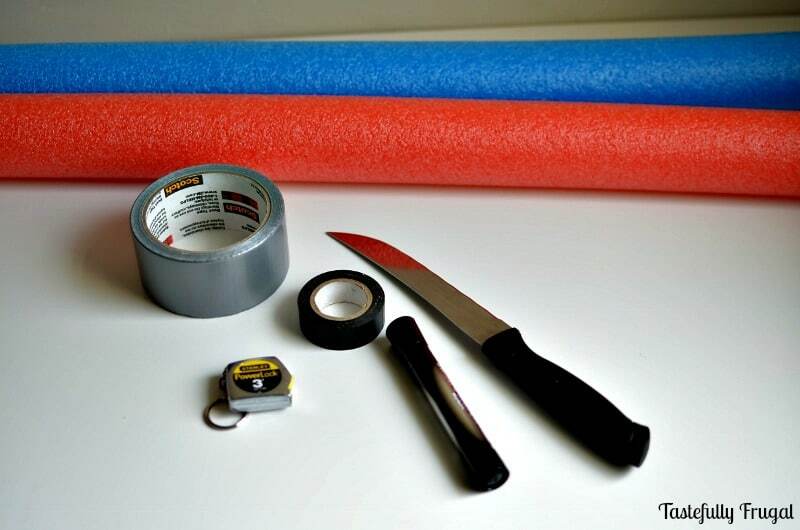 Measure the length of pool noodle and mark center with the marker. 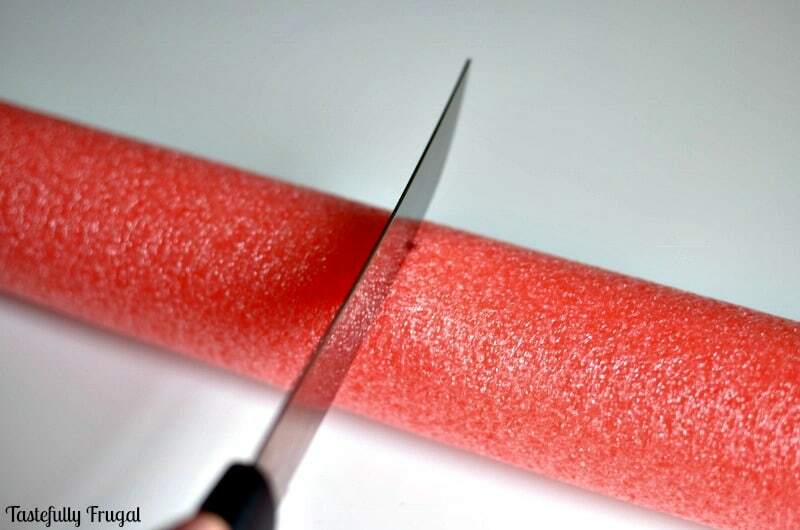 Using the bread knife cut pool noodle in half (It’s easiest to use a bread knife because it has the longest blade and makes a smooth, easy cut). 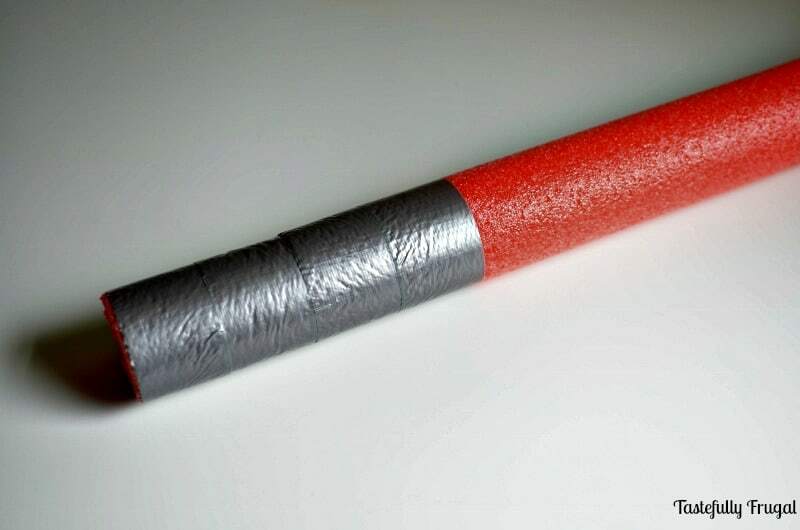 On one end of the pool noodle wrap duct tape around once. Trying to overlap only a little bit wrap duct tape around 3 more times. Wrap two rows of electrical tape right above the top of the fourth duct tape wrap. Cut seven 3″ pieces of electrical tape and tape them vertically under the second row of duct tape about an inch apart from each other. Trying to overlap only a little bit wrap duct tape around 2 more times. Wrap two rows of electrical tape right above the top of the third duct tape wrap. Wrap 3 more rows of electrical tape under the first row of electrical tape spacing each row about 1/2″. 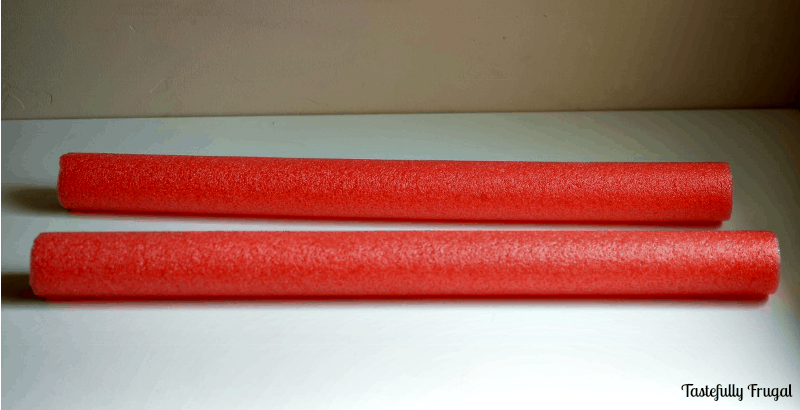 Measure length of pool noodle and mark center. Wrap two rows of duct tape around center. Wrap three rows of electrical tape, one on each end and one through the middle. 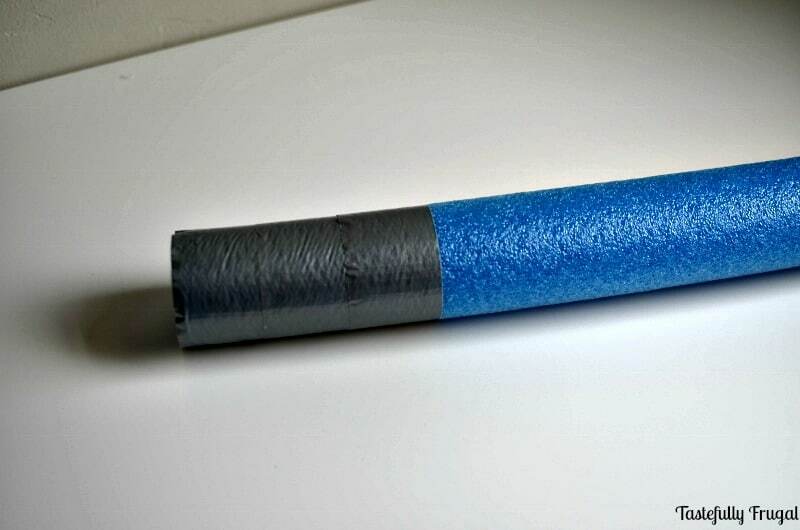 Hold the duct tape tight as your wrap around the pool noodle to keep out any wrinkles (if you do get wrinkles just lift duct tape up and smooth out then lay back down). Start every row from the same spot so you only have overlaps in one place. Dollar store duct tape works best. It’s not as sticky as name brand so it’s easier to lift and move around if you do get wrinkles. I love taking ideas from Pinterest and bringing them to life. To get more Pinterest inspiration check out these projects from some of my blogging buddies. 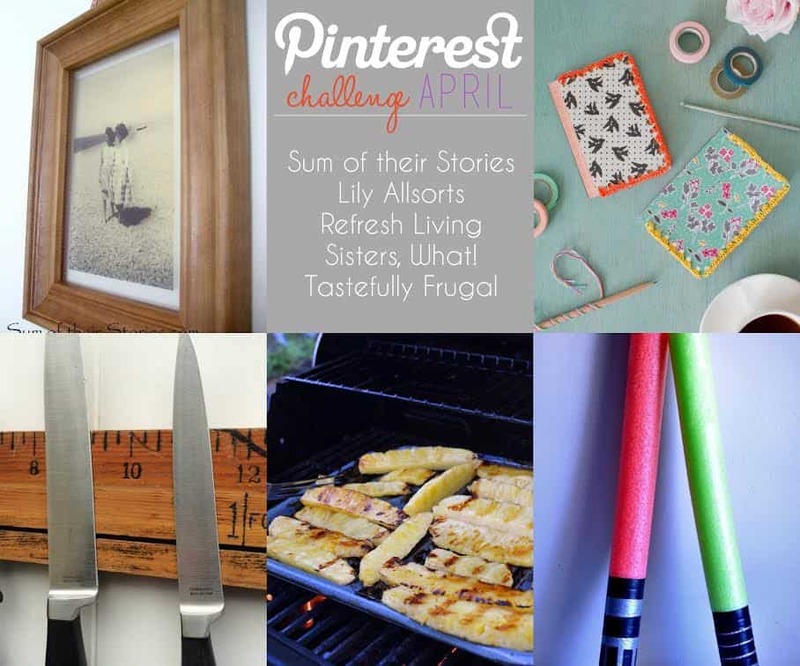 And don’t forget to follow me on Pinterest to see what’s inspiring me and what I’m sharing here on Tastefully Frugal. They are great! When they were younger my boys would make light sabers from anything – even cucumbers in the supermarket – what am I saying, “when they were younger”, given half a chance they would love to “play” with these right now! Thanks Julie! And I totally know what you mean…my boys have light saber battles with anything and everything. But at least with these it’s much safer and less mess for me to cleanup afterwards. What fun! I’m sure these were a big hit! I think our boys would get along very nicely (he is a little obsessed). My sister in law made these for her girls and I’ve been dying to make some, but haven’t got around to it. I love that you also made a Darth Maul one. I bet they would Havalah! I love all the Star Wars posts you share!! Darth Maul has definitely been the favorite. Sydney these are awesome! What an amazing idea for your son’s party! It sounds like so much fun. Thank you Emma! It was a ton of fun!! How fun are these?! I remember making ‘swords’ out of sturdy cardboard when I was younger- these would be a lot softer and they look like they are glowing! 🙂 Thanks for sharing Sydney! Pinned! Oh I used to do that too AJ…so much fun! Thanks so much for sharing!! I like these, especially because they made to look like the ones in the movie. But I am having a hard time finding red pool noddles, the ones at the walmarts need me a pink color, i want them to be correct, but am having a hard time finding red ones. Where did you get your red ones? Hi Jessica! I can’t remember if I found the red ones at Dollar Tree or Target… I think it was Target though. I would love to see yours when they are done!! Does it matter what kind of pool noodle you get? I know some can be pretty flimsy. Nope it doesn’t really matter. 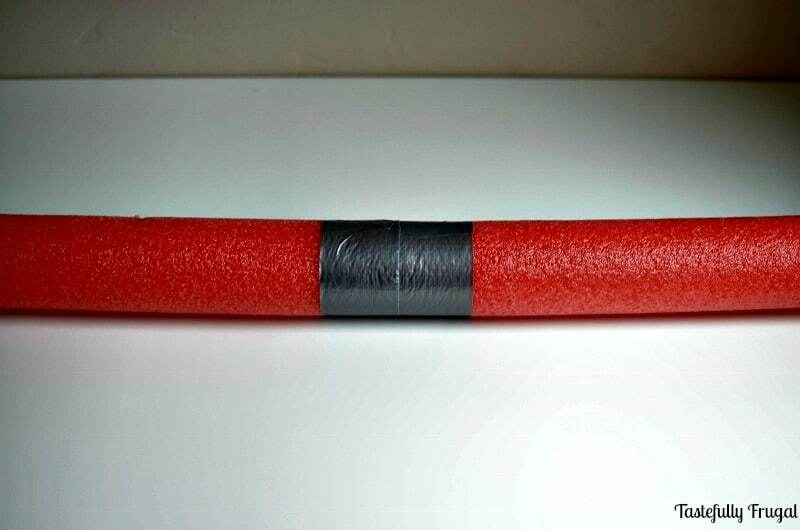 I’ve used pool noodles from the dollar store, Walmart and Target and they all have worked great! Sign up for a weekly newsletter! I’m Sydney, the creator here at Tastefully Frugal. I’m a mom to two crazy little boys and one little princess and married to the best guy around. My goal is to help you do more with the money you have. From recipes to meal plans, crafts to organization tips and more! Don't miss a single recipe, craft or money saving tip! Sign up below to get Tastefully Frugal sent directly to your email!